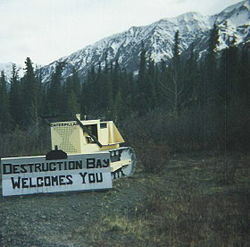 Destruction Bay is a small community on the Alaska Highway (historical mile 1083) in Canada's Yukon on Kluane Lake. The population in 2001, according to the Census, was 43. The population was 55 at the 2006 census. Most recently, the population of Destruction Bay in 2011 has dropped to 35 people. 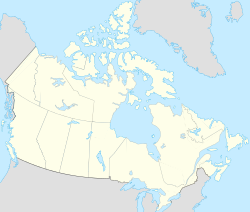 Populated mostly by non-aboriginal residents, community residents provide Yukon government services to residents in the area (school, highway maintenance), including nearby Burwash Landing and some tourism-related businesses along the Alaska Highway. The name is derived from the wind blowing down structures erected by the military during highway construction in 1942–43. The community has a one-room school serving kindergarten through grade eight. ^ a b Statistics Canada. Released October 24, 2012. "Destruction Bay, Yukon (Code 6001049) and Yukon, Yukon (Code 6001) (table)". Census Profile. 2011 Census. Statistics Canada Catalogue no. 98-316-XWE. Ottawa. Retrieved July 30, 2015. ^ "Population and Dwelling Counts" (PDF). Exective Council Office, Government of Yukon. May 2002. Archived from the original (PDF) on March 31, 2014. This page was last modified on 30 July 2015, at 19:18.